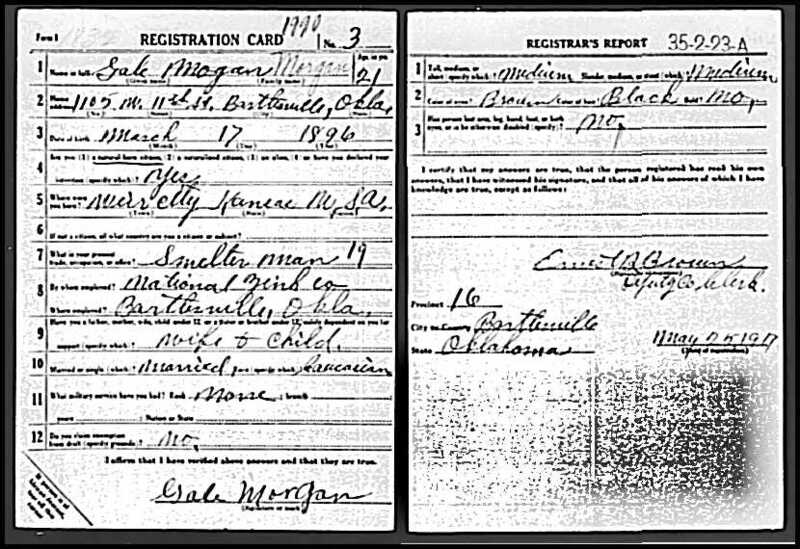 Gale R. Morgan was born in March 17,1896 in Kansas (probably Iola City), and died July 10, 1978 in Bartlesville, Washington County, OK. Burial: Memorial Park Cemetery, Bartlesville, Washington County, Oklahoma. He was the son of Lester Morgan and Anna . He married Mary about 1914. She was born about 1888 in Texas, and had a son, Elmer Bean before they were married. 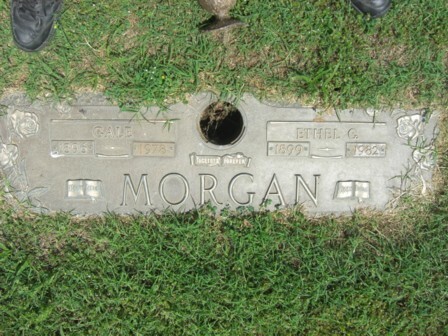 Gale Morgan is buried in Memorial Park Cemetery with his 2nd wife Ethel (nee Miner) Morgan, born June 10, 1899 in Oklahoma, died May 30, 1892 in Broken Bow, Tulsa County, OK. National Zinc retiree. Neekamp Funeral Home, Bartlesville, OK. Obituary-Bartlesville Examiner-Enterprise 121 Jul 1978, page 3. In the 1900 census, Gale appears in Iola City in the house of his parents Lester (born Nov 1860) and Anna (born Nov 1866 – maiden name probably Humphries). Also had a sister Grace (born April 1885 in Kansas), brother Guy (born Feb 1890 in Kansas), and brother Gilbert (born Dec 1892 in Kansas). Lester Morgan (apparently fond of the letter G for names – maybe after his father, George?) was born in Illinois. Sometime before 1920, he married Minnie . He had another son Glen in about 1913, born in Oklahoma. Don’t know for sure yet whether Anna or Minnie was the mother – or when Anna died. In the 1920 census, we find Lester, wife, and son Glen in Bartlesville Oklahoma. On the same page, Gale Morgan (age 24), his wife Mary (age 21), a step-son Elmer W. Bean (age 5 and born in Oklahoma), and their 2 1/2 year old son Donald Morgan, also born in Oklahoma. Donald Morgan’s tombstone photo below taken by “widow” – FindaGrave volunteer. 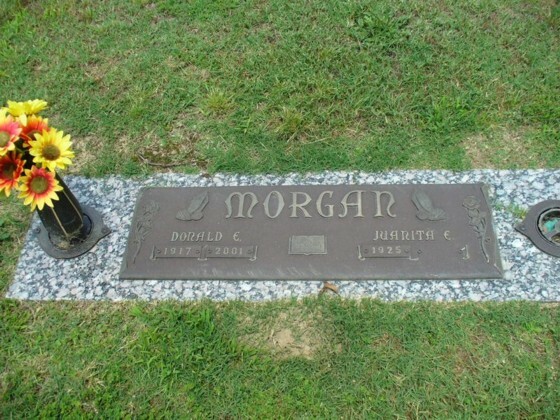 Donald Edward Morgan born in 1917 in Oklahoma, and died in 2001 in Hot Springs, Garland County, Arkansas. He married 1) Gwendolyn Keith in 1941, and 2) Juanita Pearl Evenson. Burial: Crestview Memorial Park Cemetery, Hot Springs, Garland County, Arkansas.